The temps are dropping like crazy and we're getting all sorts of lovely Maine winter weather. In only two days, our weather changed from frigid and windy to snowy then to freezing rain. Lovely. 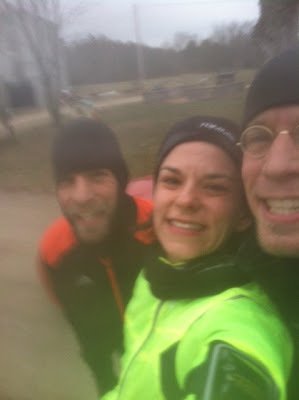 Yesterday morning, I went out for a run with the husband and brother-in-law. I also need to mention that it was 16F. Brrr. We ran 5 miles and it was a lot of fun. Finally I'm able to at least keep up with those fast and speedy BQers for their slow pace with a comfortable middle pace for me. They were both definitely hoping for me to be slower because they kept telling me to slow down. 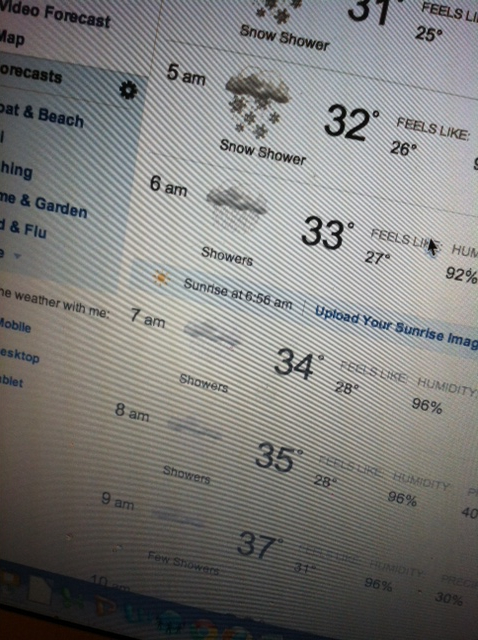 Then last night, I thought I'd look ahead to this morning's weather. Ugh. We already had a light snowy coat outside...then add freezing rain on top of it = ice rink. Not fun. I quickly started tweeting Maine Mom on the Run about the weather. I finally convinced her to be a wimp with me and run at the gym on the treadmills with me. Then I texted Jill and Stacy but both of them had other running plans. But then this morning, Carrie texted me and said it was too icy to drive to meet me (and it was really bad at that time) and that she'd be running at her house. Which meant it was a lonely run for me at the gym. As it turns out, it was a super large ice rink out there. The conditions were horrible for driving and the rail trail was a sheet of ice. Going to the gym was the best decision ever. The decision seemed even better when I got to the gym and fell on my way in. You might be asking why I even drove in those conditions? I was scheduled to work there from 9-12 anyway. I really need to add that last year I would have just run outside in that crap anyway and felt badass for doing it. But this year, I have access to my gym whenever I want and I was really feeling it. 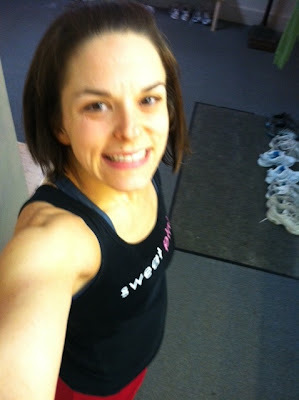 So, inside, with my Sweat Pink top and cute Mizuno running skirt it was. 14 miles on the treadmill before my gym shift was done! Now doing 14 miles on the treadmill should make me feel badass. I don't know how people do most of their long runs on the treadmill. I found myself getting quite bored with the tv and my iPod. What I really wanted was my running girls to be there with me. That would have helped. However, I will add for the last 45 minutes, one of my co-workers showed up for his run and I did talk his ear off for that entire 45 minutes. Poor guy. He was probably looking for a break from a nagging woman. Nice job knocking out the miles on the treadmill! You are going to hate me but it was in the 70's here today. Not sure when winter is planning on making it to the south but until it does it's back to wearing shorts and flip flops. What crazy weather we're having! Even though I like the cold, I am hoping it is a little warmer than 16 degrees for the Mid Winter Classic! I CANNOT imagine 14 miles on the TM... I managed 80 minutes once, watching Toy Story 2! But that was it for me. I admire your perseverance for sure! Oh that is very badass to be on the treadmill for that long!!! I had to do that once when I was training for Boston due to icy roads but I also had my running girls there on either side of me so it was easier! The weather is bananas!!! Freezing here one day and then yesterday was 57!!! Great job getting it done! Guess you don't want to hear about how I have on a T-shirt with my windows open right now in this insane midwest winter heat wave. I sweated putting out Christmas decorations yesterday. I'm not looking forward to old man winter showing up though. I really like working out outside. Way to go getting in those miles! Wow way to go! 14 miles on the tready sounds like torture to me, but then again so does running in 16 degree weather:) You rock! Nice job! There's an awful lot of mental strength needed for long runs on the treadmill! And sometimes you just can't risk the ice. Great job! Props to anyone that can do long runs on the treadmill, I definitely won't! 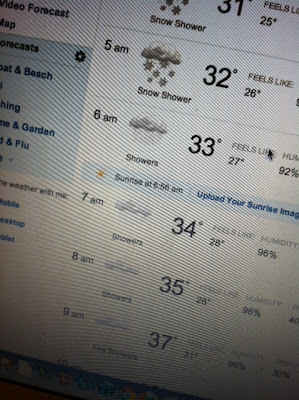 I wonder what the weather will be like in Maine when we are there for Christmas. Impressive! 14 miles on the treadmill is loooong. I haven't used treadmills much at all since moving south, but they are nice to have in that kind of weather! Brrrr so cold! Smart of you to choose to run inside when you can. 16.... That is ridiculous! I am so amazed at your dedication to run in that weather. I moved to SC to escape the cold and am so glad I did.